For Valentine’s Day I had been trying to come up with a quick little gift that I could make for the boys & girls in Claire’s class that they could use over and over again. While these little guys are lots of fun, I also realize that kids + candy = BFFs so we’re planning to add a monster crochet bookmark to the top of a sucker. I have another fun Valentine’s Day treat holder pattern on my blog, click here if you’d like to check that one out. 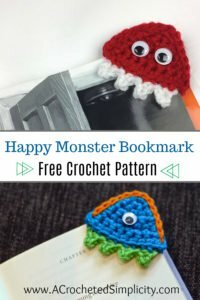 The Happy Monster Crochet Bookmark is a super quick little project that requires minimal amounts of both yarn and time. Because I have to make 33 of these little guys, I chose to go with store bought googly eyes (as opposed to hand embroidering eyes on). I think they’re super cute and bring the little bookmarks to life. 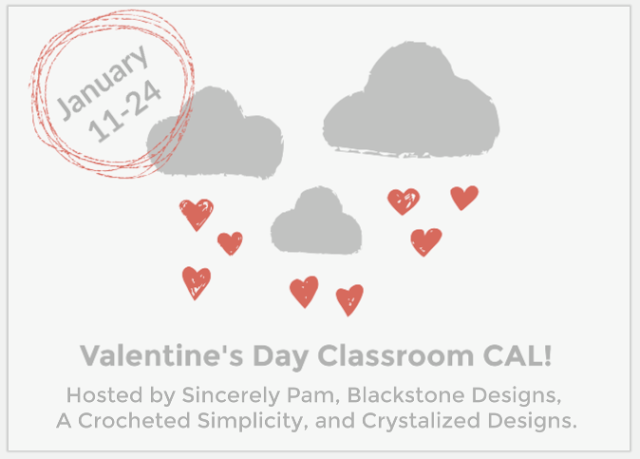 This pattern is part of the 2019 Valentine’s Day Classroom CAL! 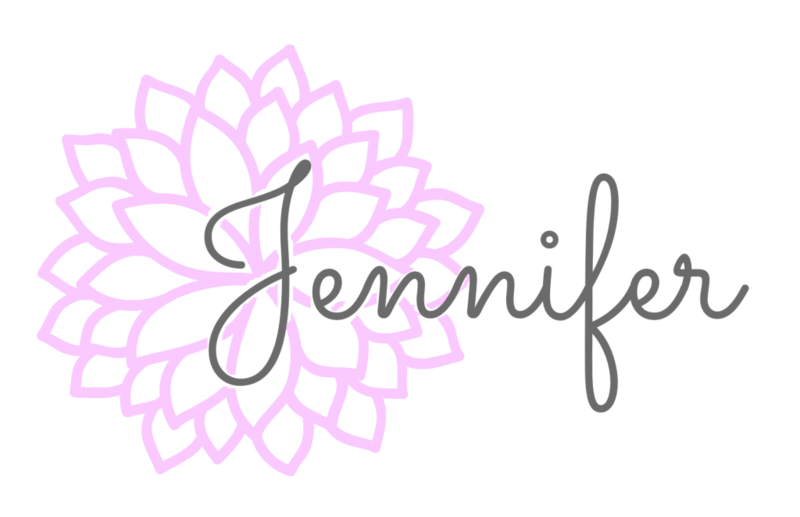 Once again, Blackstone Designs, A Crocheted Simplicity, Sincerely Pam, and Crystalized Designs have teamed up to bring you a fun blog hop style CAL. Each designer wrote a brand new Valentine’s Day themed pattern that is classroom friendly! While each pattern will be on our blogs, you will need to join each designer’s Facebook Community Group in order to participate and enter to win prizes. This CAL runs from January 11th-24th. When you finish each pattern, you will post a photo of your finished item in that designer’s Facebook group to enter to win a pattern from that designer. You can also upload a photo of your finished item to Ravelry projects and be entered to win a $25 Gift Card to Amazon! The more projects you complete, the greater your chances of winning! Don’t forget to tag your WIPs and finished projects on social media using #VdayCAL so we can see what you’re working on! Ready to get started? 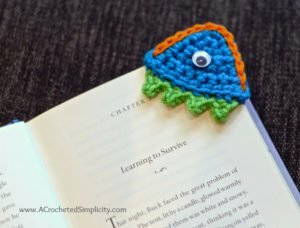 Keep reading to make my Happy Monster Crochet Bookmark! You can find the date to the next designer’s pattern at the end (link will be activated on their date)! *You can shop for all of your materials in one place thru our affiliates. Do not fasten off. Continue below to Edging. This section is worked on 2 sides of the triangle only. Refer to the photos below. Fasten off. Weave in ends. Make one more triangle then continue on to Adding the Teeth. Fasten off. Weave in ends. Continue on to Joining the Triangles. Designer Tip! If you’re planning to embroider the eyes on, it would be easier to do so before joining the triangles. Step 1: With right sides facing out, lay your 2 triangles on top of each other. 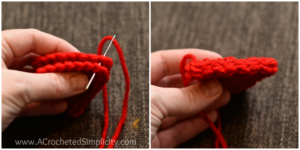 Step 2: Locate the centermost 14 or 15 stitches along the 2 sides of the triangles that you edged. 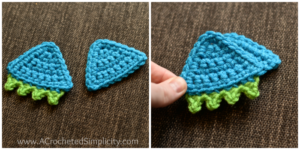 With a 4mm crochet hook and yarn of choice, sl st the 2 triangles together as shown in the photos below. Fasten off. Weave in ends, glue on eyes (if desired) and enjoy! Dates to Hop Along with Us! 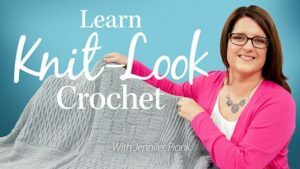 Are you intimidated by knit-look crochet? Would you love to learn my tips & tricks? Take an Annies Video Class with me and let me ease your fears and help you increase your skills! Click on the photo below to watch a free preview. You can also see the other 4 video classes I have available! 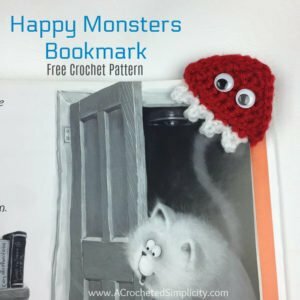 Don’t forget to join the A Crocheted Simplicity Crochet Community group to share your finished Happy Monster Crochet Bookmarks and enter to win prizes! You can enter to win now through Sunday, January 24th. Every finished project is a new entry! !